A showcase of tackiness and visual excess, The NCC's visitor centre renovation looked dated before it was even finished. 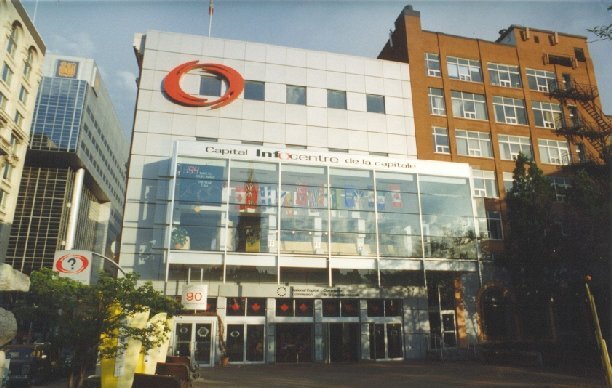 The Capital Info Centre was the NCC-run tourist information office. While a not a bad idea in principle, the Info Centre unfortunately reeked of what could be generously described as exuberant 1990s office park architecture, better suited to the headquarters of a high tech firm in Kanata than its conspicuous location across from Parliament. 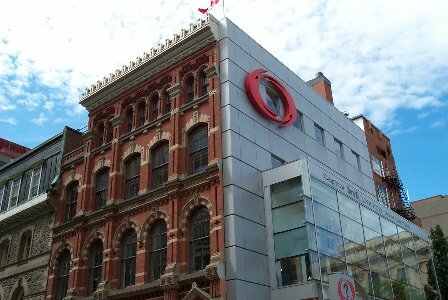 Situated on an historic site at Sparks Street and Metcalfe, the Info Centre looked out on Parliament Hill, over the former site of the Rideau Club. The club, damaged by fire in 1979, was expropriated by the feds and the site has been vacant ever since. In the mid-90s, the NCC renovated the Info Centre. In typical schizophrenic style, almost as soon as the renovation, conservatively estimated to cost $4.3 million, was finished, the NCC proposed demolishing the centre, along with the rest of Metcalfe Street with its Grand Boulevard. What it lacked in visual appeal, however, it more than made up for in symbolic resonance. The NCC has always been more concerned with shallow appearances, the latest trends, and justifying the cinchy jobs of its absentee patronage-appointed directors than with the workaday job of making Ottawa a more livable city. In the late 90's, the building featured a prominent "millennium" clock counting down the days to January 1, 2000. Always looking for ways to maximize taxpayer dollars, we'd like to propose that the clock now be put to better use counting down the days to the abolition of the NCC. After the Mandate Review in 2006, the Info Centre was closed and replaced with a kiosk.